Bazaar, products expo, trade fair or trade show is another way to promote a business, giving opportunity to display and introduce products to potential customers. When signing up for a trade booth space, the total cost involved always determines whether or not to invest in a trade show. Meaning you should first calculate the overall cost vs. the amount of business or leads you can generate. 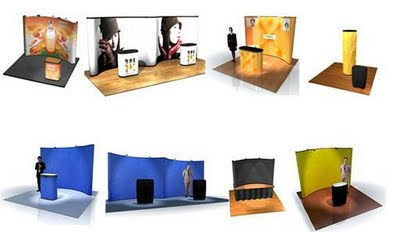 Next thing to consider is the set-up location and the need to come up with a good company introduction in your booth to effectively market your products or services. Some exhibitors uses logo mats or logo canopy to create an eye catching company presentation. Trade show flooring as well as trade show carpet conveys an inviting presence adding up a nice comfortable touch to any exhibit. As the customers stepped-in, make sure not to be too pushy, provide detailed answers on customer's queries and don't forget to come up with a short registration form asking their full name, address, and contact numbers for referrals or follow-ups. I remember i got our wedding caterer thru a Bridal Show display and i was drawn to commit because of the presentor's nice and friendly approach, i was well introduced to their packages making me ask for more infos, taking home a complete catalogue of food choices with corresponding price and soon visited their shop and finally, the sale aggreement was made! I am the type who easily got tired of having too many choices so i always make sure that i end up with just 2 or 3 to review for price and quality comparison. At that time, i'm thankful enough to accidentally discover a trade show that unexpectedly introduce me to "Towns Delight" as our official wedding caterer. It's interesting to see how the experience went for you. Sometimes expos can be so pushy, but it's good to see how a quality experience can translate to success.